Complete collection of Benzonia logger audio interview tapes collected by William and Edith Overlease. Stories of direct participants from the 1890s to 1916, though some accounts go back to the 1880s. The transcriptions retain the dialect and vocabulary of the old lumberjacks and workers. This work is an unparalleled primary source for anyone interested in the lumbering history of Northwest Michigan. 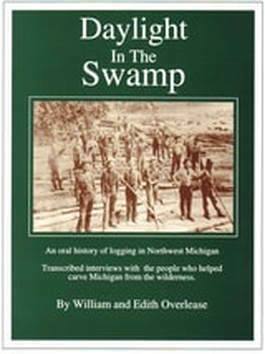 Daylight in the Swamp is based on oral histories of logging in Northwest Michigan collected by William and Edith Overlease. These tapes, donated to the Benzonia Public Library by William and Edith Overlease, have been digitized by The University of Michigan.